On his honeymoon in Naples. "Race for life in the Australian Bush"
1916 - Courtesy of Charles Miller - Frank's great-grandson. Lady Meux - Painted by Whistler circa 1881. 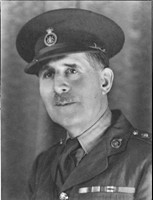 Major Francis Angerstein Clarendon Rowley Hyde. To view either Frank Hyde's Virtual Gallery or David's Lubang Island Site, click the appropriate button below. Born 8th Oct. 1849. Eldest son of Captain John Francis Hyde (38th Regiment) and Elizabeth Gudge (formerly Meeson, grand-daughter of Admiral Collins) and they married in St Marys Church Marylebone, London, 1st January 1849. During childhood he mainly lived in London where his parents seem to have been part of the social scene, but holidays were spent at the family estate Hyde End Manor where he became a good fisherman and horseman. He was the tallest of his brothers being 6 foot 8 inches tall. He started his career in art as a war artist doing black and white drawings for The Graphic in the Franco-Prussian War of 1870-71, and held the rank of First Lieutenant in the Royal Engineers. Frank married Constance Mary Louise Fellgate on 16th Nov. 1876, but she died less than a year later. Then at St Lukes Kensington, on November 1st, 1881, he married Florence Loiuse Rowley, a niece of Admiral Rowley. 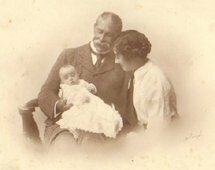 They had two children, a daughter Mina and a son named Francis Angerstein Clarendon Rowley-Hyde. He traveled widely and painted many different types of subjects. He did many amusing paintings for Raphael Tuck the card manufacturer, but unfortunately their original building together with all their records was destroyed by a bomb in the Second World War. The print "A little help is worth a deal of pity" is one such example and is still available - a hand coloured restrike from the old plate. Painted by Frank Hyde and etched by Leon Richeton. It measures 20 1/2 x 13 inches plus large blank margins. Another card Raphael Tuck card illustrated in Frank's virtual gallery is "Got him at last". Frank seems to have had an unusual sense of humour and this particular picture is said to have nearly resulted in him being excommunicated from the Catholic Church. Frank was an intimate friend of most of the leading artists of the day. Of interest here is that he was a member of the Minerva Club (? Savages - a travellers club in London) where Robert Louis Stevenson was also a member. 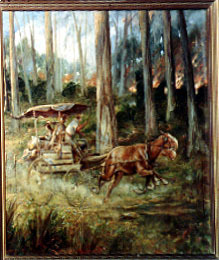 On the way to visiting two brothers in Eden, Australia he called in at Western Samoa and painted Stevenson’s tomb (circa 1908). In connection with his travels he made an heavy, dark red coloured, hardbacked volume (about 4 pounds, approx. A4 size and 2 inches thick) containing many hardbacked mounted photographs entitled "In Bush and Jungle" by Frank Hyde Vol.1, and the present whereabouts of the volume is unknown. If anyone knows its present location please let me know. Amongst the many paintings of interest of which I have no image is "Cupids revenge". If any one could send me a photo of a print made from it, or from the original, I would be very interested to receive it. Indeed I am interested in receiving images of any of his paintings as there is no record of most of them. Note: In August 2009 I received from a lady living in Canada an image of a small engraving of "Cupids's Revenge" and I have added it to Frank's virtual gallery. Additional information is available on the left of this page. Paintings exhibited at the R.A. include: Little Samuel 1872; the Greek Slave 1873; Miss Hall, daughter of Mrs.Hall 1874; The Garden at Axel Monthe’s villa in Capri, 1878; Are you coming with me? 1885; A Pergola, Capri 1912; Roses and Lilies, Capri 1914; A Race for Life in the Australian Bush, 1916. I would be pleased to receive any further information on Frank Hyde and this site will be significantly added to and improved in the future. Acknowledgements and thanks to Elizabeth Miller, Charles Miller, Alan Hyde, my twin sister Audrey Paterson, and to Natasha Wallace for assistance with site development. Site first established 19 April 2001 at TalkCity, but following it's closure in early August 2002, the web pages were shifted to AngelFire. and a link to some items of mine.